Since I recently painted up some more gendarmes, I added them in, substituting them for their dismounted equivalents from one of my last used lists. In the photo below, Burgundians are on the left. From foreground (Burgundian right flank) to background we had... Coustilliers followed by Household Gendarmes, skirmishing Archers behind a low stone wall, a block of formed Ordonnance Archers, Ordonnance Pike, and a second block of Archers. Beyond the central blocks was a unit of Crossbowmen with pavise. In the (ruined) farm were some skirmishing Handgunners, and on the far side of the farm were some Gendarmes. 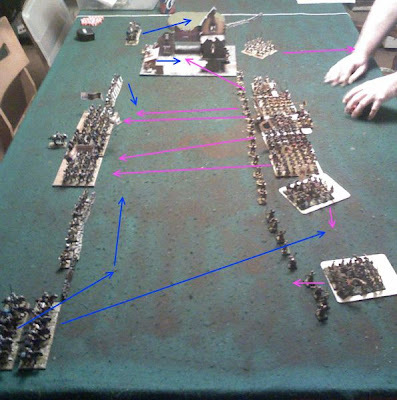 The Scots, on the right, had three screening units of skirmishing Archers across the bulk of their line, then from foreground (Scots left flank) to background the main body of troops consisted of two warbands of Highlanders, two Pike Schiltrons, another Highland warband, one more Schiltron, and some camp followers. Behind the ruined farm were some Border Horse and one more group of skirmishing Archers. The Burgundian left was a disaster. The gendarmes easily chased off the border horse, but were ambushed by lowly archers and destroyed. The handgunners shot off several rounds before losing combat to the camp followers who came into the ruins to fight them. On the Burgundian right, things were a little different. The coustilliers chased off the skirmishers, and broke through the the rear of the Scots line. However, one of the bands of highlanders had panicked due to heavy casualties from bowfire, and had fortunately rallied in a position to keep the coustilliers from taking advantage of their breakthrough. In the center the Scots rushed forward through a storm of arrows and hit the Burgundian line -- but not hard enough. The Burgundians held long enough to allow the crossbowmen on the left and more importantly, the household gendarmes on the right to swing in on the flanks. The Scots resisted panic from the initial charge itself, but the casualties from the Gendarmes were great enough to crush the first schiltron in front of them and send almost the entire center fleeing. The victory was just crushing enough to save face for the embarrassing defeat against the underhanded commoners on the left flank.